Four F-15 Eagle pilots, Maj. Andrea Misener (far left), Capt. Jammie Jamieson, Maj. Carey Jones and Capt. Samantha Weeks, walk to their respective jets at Elmendorf Air Force Base, Alaska, July 5, 2006. Weeks, commander of the 57th Adversary Tactics Group at Nellis Air Force Base, Nev., has known she wanted to be an Air Force pilot since she was six years old. It was a passion that stemmed out of countless hours spent around aircraft during her father’s career as an Air Force maintainer. Timing was on her side. Weeks graduated high school in 1993, the same year that Congress lifted the ban allowing women to become fighter pilots. Weeks entered the Air Force in 1997, after graduating from the Air Force Academy with a bachelor’s degree in biology. Upon completing her specialized undergraduate pilot training, she flew the F-15C in support of Operations Northern and Southern Watch in Iraq. She went on to fly for the Air Force Thunderbirds as opposing and lead solos, serve as an air liaison officer with the 607th Air Support Operations Group at Osan Air Base, Republic of Korea, and held the position of executive assistant to the commander at North American Aerospace Defense Command and United States Northern Command, among other positions. As a female pilot in the Air Force, Weeks is a member of a small but growing club. 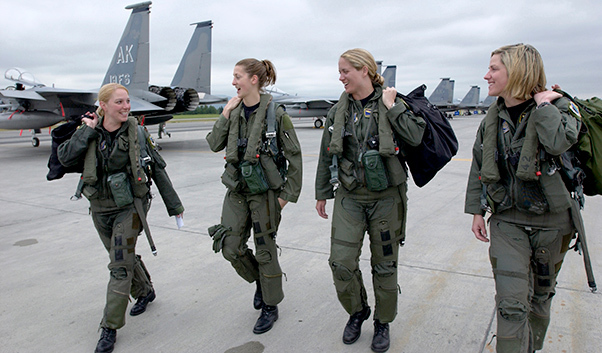 Today 5.8 percent of Air Force pilots are female, up from 3.4 percent in 2000, according to the Air Force Personnel Center. “The reality is I didn’t have a lot of female fighter pilot role models growing up just because very few females (fighter pilots) existed at the time,” Weeks said. She names Gen. Laurie Robinson, commander of United States Northern Command and North American Aerospace Defense Command, as the woman in the Air Force she looked up to most as a young airman. Weeks says the Air Force has evolved significantly since she first started flying, particularly in integrating new technology. Flight equipment was not designed for smaller-framed individuals, and hasn’t been changed to fit a female’s statute. The Air Force has acknowledged that the current flight equipment needs an update. Gen. Mike Holmes, commander of Air Combat Command, said this initiative is not special treatment but equal treatment. The Air Force has developed a working group, comprised of Col. Weeks and other female aviators, to discuss ways to address the flight equipment issue. There was also a conference sponsored by Air Combat Command that she recently attended at AFWerX, an Air Force innovation hub with industry partners, to discuss how to improve flight gear and equipment for female aviators. Most flight gear is gender neutral, taking factors such as height and weight into consideration, not gender. Part of the ACC flight gear initiative includes considering the development of equipment that is adapted to the physiological differences in gender, in order to reduce stress of aviators. 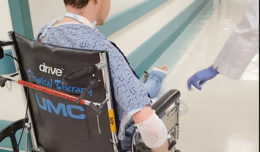 “(The event) really just helped us to try and see the problem from many different angles and vantage points to ensure that we properly understood the situation before we jump into solutions,” Weeks said. “We are looking for ways to better our gear for females, as well as some males. The Air Force has evolved over the years and continues to evolve. The female aviators entering the Air Force now will not have the same issues I had over the last 21 years.